OK, this stuff really looks like a witches brew! Even so, kombucha is my ferment of choice. I love tea in all it’s incarnations. Kombucha is a fermented tea and really showcases the flavour with a funky edge. You can do a second ferment to introduce new flavours such as fruits and spices however the naked “booch” is really good! Kombucha is a sour tonic tea fermented by a community of organisms called a SCOBY (symbiotic community of bacteria and yeast). The SCOBY is also known as the “mother”, it has a rubbery texture and floats on the surface of the liquid which it ferments. SCOBY’s tend to grow at a rapid rate so you can usually source one from a fermenting enthusiast in your circles otherwise there are plenty of companies online where you can find one. The recipe below really does use the minimal amount of sugar necessary to feed the SCOBY, this is good if you do not like your beverages too sweet or you have to watch the amount of sugar you consume. You can easily up the amount to 1/2 a cup per litre. The organisms in the SCOBY will consume a fair amount of the sugar. The science is still out on the health benefits of kombucha however the myriad of probiotics in a well brewed booch are a great tonic in an overly clean world. You can find out what bugs are in it here. 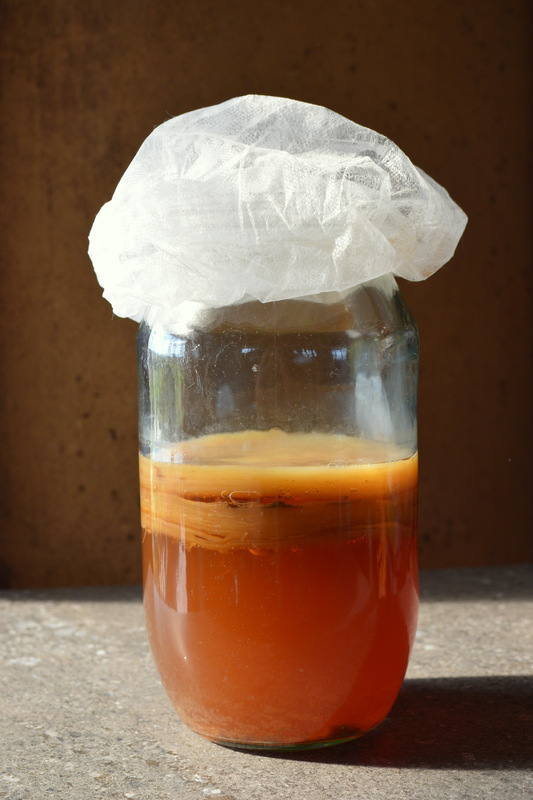 Just a note on safety – if your brew or the SCOBY starts growing mould, smells off or just looks or tates iffy – toss it. Source a clean one from a trusted source and start again. Plain tea (Camellia sinensis) - black, green, white ... nothing flavoured or scented - 2 - 5 tea bags (depending how strong you like your tea). 1/4 cup sugar - raw, panella, rapadura, are all fine. 1 litre of non-chlorinated water - filtered, rain, spring. Covering for the vessel - fine weave cotton or doubled over disposable food prep hair nets - do not put cling wrap or another impervious material over the top and the organisms in the SCOBY are aerobic and need oxygen to ferment. 1. Boil the water and pour over the sugar and tea bags, stir until all the sugar is dissolved. Let the tea steep for at least 15 mins before removing, feel free to leave the bags in until the water cools if you like an intense tea flavour. 2. Let the water cool to below body temperature or overnight. 3. Place the SCOBY on top of the tea, don't stress if it sinks, it may make it's way up to the top or float at a funny angle however if it sinks like a stone a new scoby should grow over the top of the tea during the fermentation period, this will become your new scoby and you can compost the old one or give it the chooks! 4. Cover the vessel making sure the fabric is affixed securely with a rubber band or elastic. 5. Leave to ferment in a warm spot (ideally 24ºC - 30ºC) away from direct sunlight. Fermentation can take anywhere from 5 - 14 days. The kombucha will ferment quickly in warmer temperatures and more slowly in lower temperatures. 6. Use a clean straw or clean spoon to sample a little kombucha from below the SCOBY to ascertain the readiness - it should taste tart and a little sweet. If your ferment tastes off in any way or the SCOBY becomes contaminated with a mould discard the batch, source a clean SCOBY and start again. 7. Once the kombucha is to your liking carefully remove the SCOBY with clean hands (use natural soap and rinse well - not an antibacterial hand wash) or food prep gloves and have the next sugar/tea solution ready to go. 8. Decant the brew into clean jars for refrigeration or a second ferment. 9. Slip your SCOBY into the fresh batch of tea solution with 1/2 a cup of the current batch and off you go again! The master of fermentation, Sandor Katz, writes a little more on kombucha brewing variations and answers a few troubleshooting questions here. « Turmeric Paste: Your Daily Dose of Sunshine! Yum!! I LOVE this beverage – & knowing it’s doing me good makes it even more special – thanks Sarah!